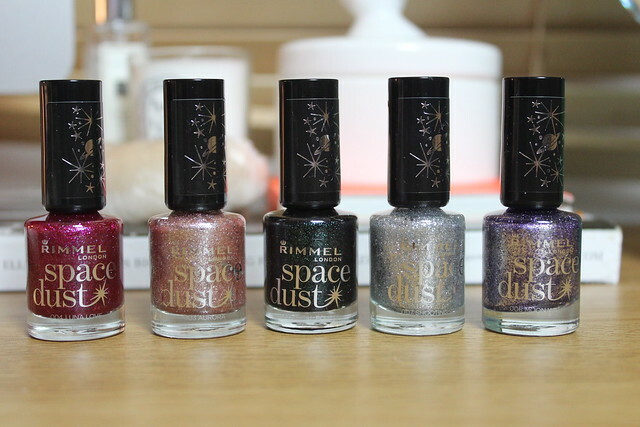 Rimmel have a pretty new range of matte-glitter nail polishes that have just hit the shelves and the shades are rather lovely so I thought they would be worth a closer look. If you like glitter… then you will love this! I’m not usually a big fan of matte finish polishes, but actually have started to come round to them since I tried one from the Topshop AW Collection – basically because a matte finish polish actually means you’re sort of getting two polishes for the price of one… one matte and then simply add a glitter top coat and you have a glossy version of the same shade. The same applies to these – I personally like to add a slick of top coat over the glitter – firstly because it makes the texture smoother and secondly because I like the glossy finish. There are five shades (L-R): Luna Love (deep pink), Aurora (soft pink), Total Eclipse (black with green glitter), Shooting Star (silver) and Moon Walking (purple). Aurora is a paler golden pink, perhaps slightly champagne gold with a silver sparkle. The sparkle in this one is more of a mixture of big chunks and finer sparkle. This is one of my favourites as it’s quite a subtle but glam looking. Total Eclipse (of the heart…that’s not the name, just makes that song come into my head every time I read it) is a total stunner in the bottle with a dark base and greeny/purple duo-chrome glitter through it but on the nail some of the duo-chromey-ness is a bit lost when it dries matte. This is one that I definitely think looks best with a glossy coat on top. Shooting Star is the silver with silver sparkle one of the bunch. This also has big and small glitter chunks in there to create a bit more texture and contrast. The bigger glitter chunks really stand out with quite a mirror-like shine. This is another one that could do with either a base colour or three coats as is slightly more sheer on two coats than some of the others. Moon Walking is a purple base with silver sparkle – again, with a mix of big and little glitter chunks to create a texture. In the bottle the purple looks more subtle than it does when on the nail – this wasn’t one I expected to like as much as I did but on the nail I really like it and it was my favourite one to leave as a matte finish as thing there was enough sparkle that it still looked lovely. My top picks of the collection would be Aurora and Total Eclipse as think these two are the most unique shades of the bunch but overall, really impressed with these! Which is your top pick?! These look so pretty, I might have to pick some up now. 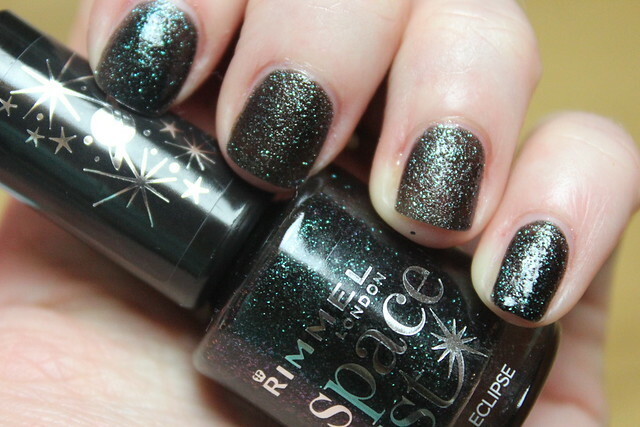 Luna Love and Moon Walking are so so gorgeous, and I really like Rimmel varnishes so I think I may go for these ones! Luna Love is like the silver version of Rose gold – Rose silver if you will – and I really desperately have to have it right now, OK? Topshop giveaway on my blog! I bet these are a pain to remove! I find glitter polishes like these never come off! I want ALL of them I’m a sucker for glitter! Oh my these are lovelyyyyyyyy!